I stumbled upon this story accidentally while I listened to music on YouTube. I hope you enjoy the story and the music too. There are more to watch on YouTube. I am excited to share this music with you. Afro-folk as she calls it herself is a unique and beautiful music with meaningful messages. The sound is like a big bowl of organic spices. I hope you enjoy Naomi’s music too. I’ve always loved this song sung by Nina Simone, but Inyang Bassey has her own riveting high energy take. Her style is hard to pin into a single music category, except her own exquisite sound. Read and hear more here. Limited edition prints, paintings and bliums, a collection of art at the Redlands performance Art Centre, Queensland. 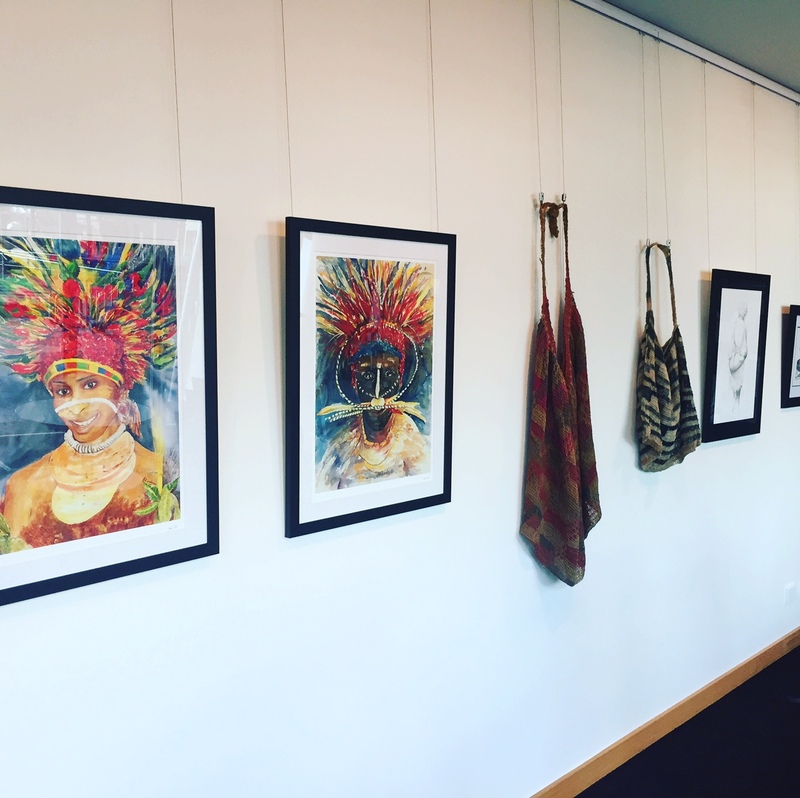 I am proud to announce that a collection of my artwork (art, textiles and pencil drawing) will be in a community art exhibition to celebrate the Melanesian Wantok Showcase. 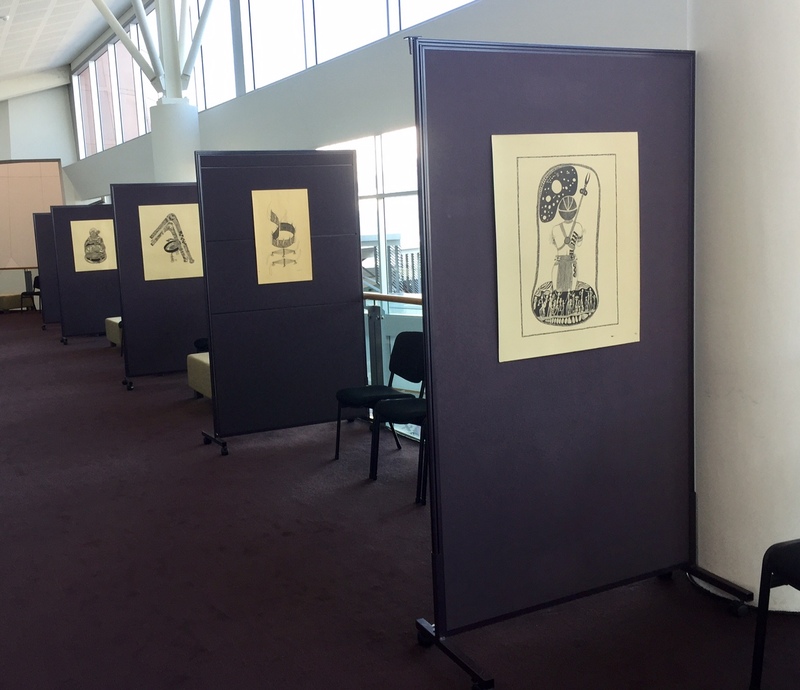 This exhibition opens in the Redland Performing Art Centre in Cleveland tomorrow. The music concert and will be on September 17, featuring musicians from Papua New Guinea and other Melanesian countries. J.K.Leahy Textile. 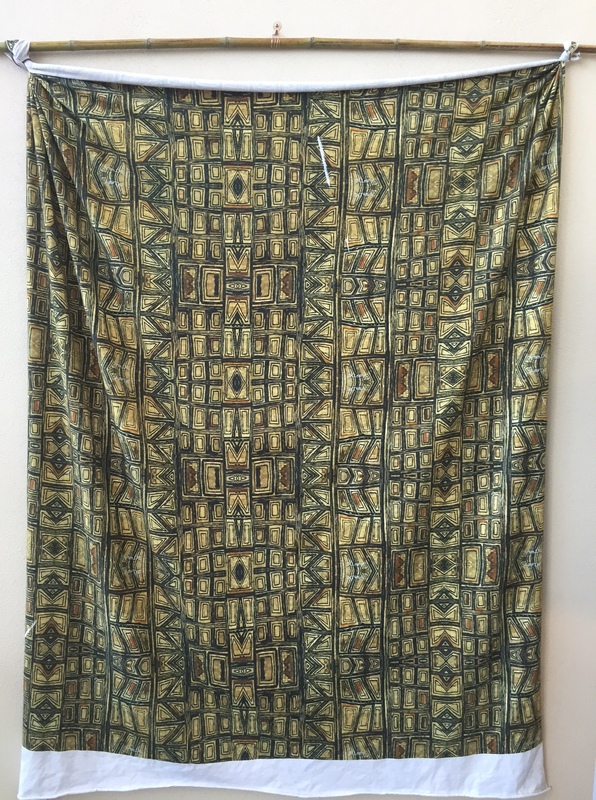 A contemporary interpretation of the traditional tapa cloth printed on cotton. 2017. Kalem – Warrior Woman fashion. Designed by J.K.Leahy. 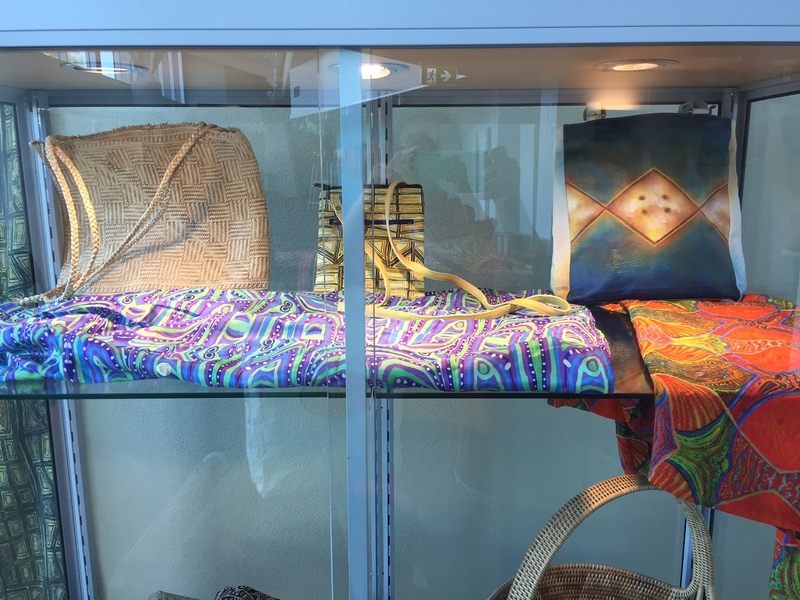 A selection of leather handbags and silk dresses on exhibition with natural fibre woven bags in Wantok Melanesian Showcase. Redland Performing Art Centre, Queensland. 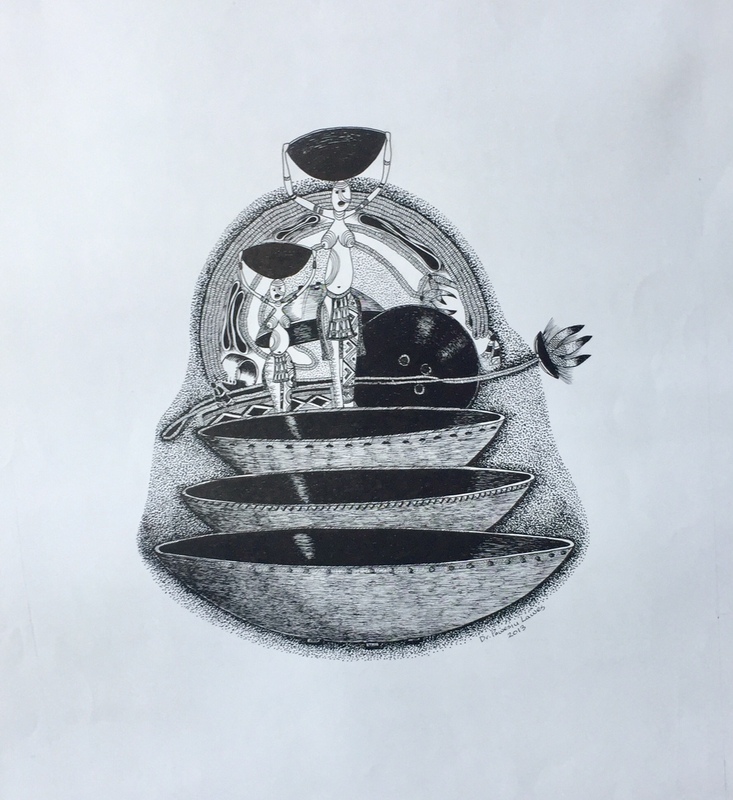 This is the first time ever artist Dr Pomasiu Lawes will be showing his pen and ink drawings. This blog will feature some of these artwork and stories that accompany each one, in the near future. Head along to Redland Performing Arts Centre (RPAC) for a night of Melanesian music and culture when WANTOK Musik performs on Sunday 17 September, on the weekend of Papua New Guinea’s (PNG) Independence. This showcase celebration is a partnership in community cultural development with the Quandamooka Festival and is an exciting opportunity to experience a coming together of Quandamooka and Melanesian communities, artists and musicians. 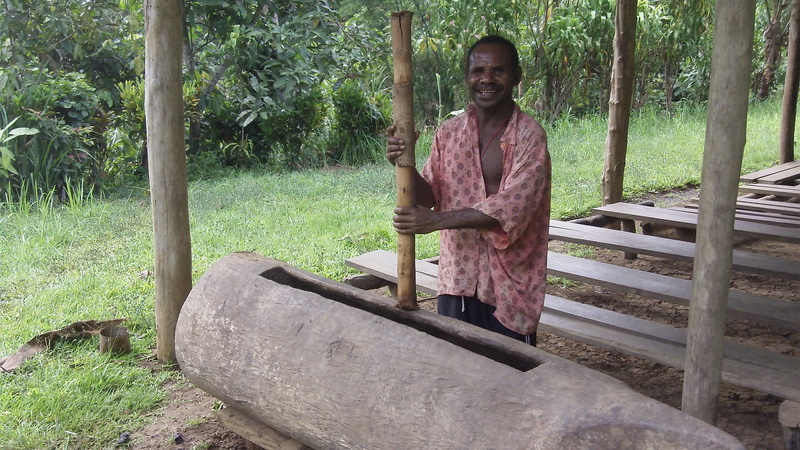 The evening will feature a fabulous line-up of contemporary and traditional Melanesian musicians. 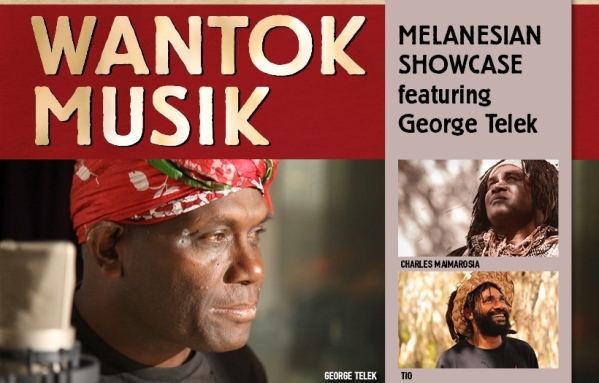 George Telek from PNG will headline the concert, bringing his signature blend of contemporary and traditional Melanesian rhythms to the RPAC stage. Telek will be joined by Charles Maimarosia from the Solomon Islands who will astound you with his talent on the pan pipes, Tio from Vanuatu with his amazing vocals, ukulele, guitar and violin skills, and Ben Hakalitz from PNG who will bring 30 years of musical experience and amazing technique on the drums to the night of celebration. They will be joined by a number of other musicians from PNG and West Papua, for an amazing night of indigenous music and culture. 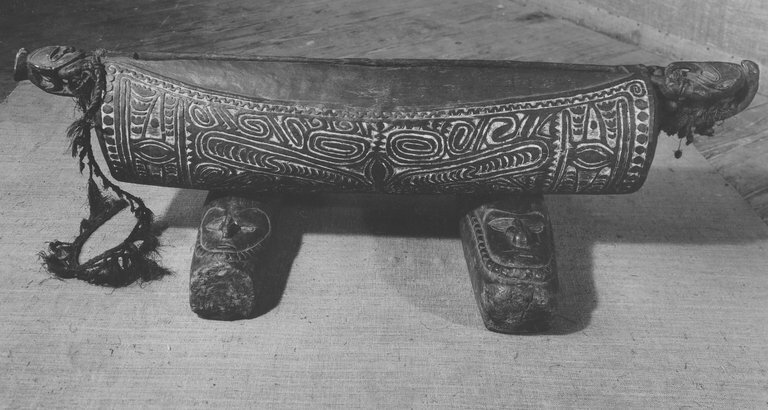 There will also be the opportunity to enjoy some Melanesian food on the RPAC Piazza, and browse the art and craft display in the Concert Hall Foyer, to complete your night of Melanesian indulgence. This art and craft display curated by PNG artist/curator Joycelin Leahy in partnership with RPAC’s Elaine Seeto will be open to the public throughout the month of September, to give you more opportunity to enjoy the pieces on display. The exhibition opens tomorrow (September 4). Don’t miss this coming together of Melanesian, Quandamooka and wider Redland communities at RPAC Sunday 17 September at 6.30pm. Tickets are $30 and can be booked via www.rpac.com.au or by calling the RPAC Box Office on 3829 8131 (booking fees are $4.10 by phone and $5 online per transaction). Thank you Slipper Edge for sharing the music of this fantastic talent, Micheal Kiwanuka. Of Ugandan parentage, who escaped the Amin regime (1971-1979), Kiwanuka (born May 3, 1987) grew up in Muswell Hill, North London. He attended Fortismere School after completion of A-levels and studied in the School of Media, Arts and Design at the University of Westminister. Kiwanuka acknowledged that his music has influences of great musicians such as Otis Redding, Bill Withers, Bob Dylan, Jack Johnson and Eric Bibb. In 1990, Wassoulou singer Sangare became a superstar in West Africa with Moussolou, which sold an astonishing 250,000 copies (many more were likely pirated). She received much of her attention for writing and singing lyrics that specifically addressed concerns of women in modern West African society, such as the conflict between marriage and personal freedom; not a shocking subject in the Western world, perhaps, but a pioneering one for the popular music of the region. Western listeners who can’t understand the lyrics will be drawn in by her mellifluous vocals and smooth, circular compositions, which use full arrangements without sounding over-produced. Both traditional instruments and electric guitars/basses are prominently used (without getting in each other’s way) on her 1993 release Ko Sira, her most widely available recording in the U.S. I love World Music and have always found the South African music very lifting. Recently, I discovered the music of Peki Emelia Nothembi Mkhwebane from South Africa. She is an award-winning Ndebele musician. Her singing, dancing and dressing embraced a multifaceted picture of the culture of the Ndebele in South Africa. The origins of the Ndebele tribe are not known, although they are generally recognised as forming part of the Nguni tribes of Southern Africa. Nothembi has travelled the world with her beautiful music. It is the right moment for me to share a beautiful thing (her music) with you because I have to return to work tomorrow. Peki Emelia “Nothembi” Mkhwebane was born in Carolina in Mpumalanga on 1 January 1953. Orphaned at the age of five, she was raised by her grandparents who could not afford her formal education. Most of her early life was spent looking after her grandfather’s cattle and sheep – their limited means of livelihood at that time. It was no mean task for a girl. Mkhwebane’s family loved music and nurtured her first love for Ndebele songs. Her grandmother taught her to play a reed flute, while her sister exposed her to isikumero. Her uncle taught her to play a home-made guitar. In this hub of Ndebele music and culture, Mkhwebane learned a lot about the richness of her culture and later started a musical group called “Izelamani zako Nomazilyana”, which performed at cultural gatherings and weddings. With time, she bought a keyboard and guitar to compose songs, which she recorded. Despite her burgeoning achievements, she still struggled to find a recording company, particularly as one of the major snags was her illiteracy, which proved to be a hindrance in securing proceeds from the recording breakthroughs. Never one to despair, and propelled by her passion and talent, Mkhwebane subsequently defeated most of these obstacles to become a world-renowned, prolific singer and performer of Ndebele music. She has travelled extensively abroad, performing in countries such as the United States of America (USA), Austria, Germany, Portugal, Australia and France. In 1988, she performed in New York and London and received an award for the Best Ndebele Song.